Indian Weddings are Extravagant Events that Often Last Three Days. Indian Weddings are colorful and exciting events! They are much different from weddings in the United States or Great Britain. A typical American or European wedding is a two day event, consisting of a wedding rehearsal day and a day that includes the wedding and a reception following the wedding ceremony. In India, things are done differently; this includes the meeting of the bride and the groom. In India, pre-marital relationships are broken into two categories: love marriages and arranged marriages. Most weddings that take place in India are arranged marriages. These are marriages in which the bride and groom's parents talk with one-another and determine that their children will be a good match for one-another. The parents then have the children meet and in some cases, the children have little to no choice in the matter and are wed. In a traditional arranged marriage, the couples begin as strangers and then must learn to love each other over time. Arranged marriages are very common in India's rural areas, but also take place in urban areas as well. Love marriages are more common in the urban areas of India. A love marriage is one where a man and woman meet one-another by chance, date and fall in love before they introduce the concept of marrying one-another to theri respective parents. In short, a love marriage is what is common in the United States, Europe and many other countries. Love marriages are a more recent phenomenon in India and are becoming more and more common due to globalization. The younger Indian generations have more and more access to western cultural ideas and philosophies and have adopted many as their own. Whether a love marriage or an arranged marriage, weddings in India will normally span three days, but can go longer! The first day is often a gathering of wedding attendees, the couple and their families. On this day, people gather to meet socially, share excitement over the events to come and to eat delicious Indian food! This gathering location is often a home, and the first day is often utilized to bless the bride, the groom, their families, the wedding location and the gathering location. For example, two days prior to my wedding, a Hindu Priest performed a Puja, or prayer, blessing for home, for those to be wed and for their family members. In addition, this is normally the day when the bride and the bride's maids have their Henna done. Henna is a root extract that can be carefully and artfully used as an ink on the skin in order to create an intricate design. Henna is sort of like a temporary tattoo because the thick root extract stains the skin for days and sometimes weeks! Applying intricate Henna for an Indian wedding is a developed skill and a specialist is usually hired to perform the service. The second day in an Indian Wedding is often celebrated as a Garba ceremony. Garba celebrations can take many forms, but always include fun and dancing. Many different dances take place at a Garba. There is normally a congo-line style dance where participants dance around the floor in a single file line. Another popular dance is performed where dancers hit decorated sticks together to coincide with the rhythm of the music; the dancers switch dance partners as the song progresses. In India, the couple to be wed is known as the bride and the bride-groom. 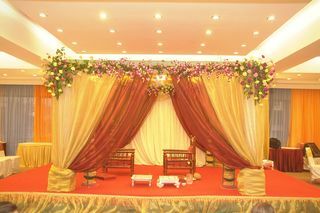 The couple may choose to have a live band perform traditional Indian music, or they may hire a DJ. Some couples enjoy pllaying a mix of Indian and Western dance music at their Garba. Garbas also include food, games and sometimes even fireworks! In a way, Garba is the part of the wedding that gives participants the opportunity to really celebrate and let-loose. The third day of a three-day wedding is where the ceremony takes place. The earlier portion of the day is all about preparation; people are gathering flowers, making final mends to clothing, picking up or preparing food and much more. Many times, a groom will ride a horse to the location of the wedding, in some regions they ride an elephant. At my wedding, I arrived in a car, not quite as unique as a horse or elephant. A woman to be wed will wear the most extravagant and colorful out-fits they can find. In many areas of India, woman wear beautiful dresses called Sari's. One reason for this is that black is considered bad luck in many regions of India. Most of all, the Indian people love color and use it on almost every occasion. Woman also wear23 to 24 karat gold, if available to them, during their weddings because Indian people like high quality gold! As far as a traditional marriage ceremony goes, its customs and activities can vary greatly depending on where the wedding takes place and the religion of those ben wed. Our marriage took place in the state of Gujarat and so we had a Hindu Priest. The wedding took place under a special ceremonial canopy, where our guests could watch. My wife and I declared our vows, were joined together by stringed flowers and walked around fire together. Regardless of the religion, budget or other factors that influence an Indian wedding, you can be assured an Indian wedding will always be colorful, fun and include great food. Leave Indian weddings to discover India culture. Discover more of India by visiting our homepage.